Nutritional value of foods chosen by students increased by 29%, and participation change was negligible. A new study found that after the new school lunch standards were implemented, the nutritional value of foods chosen by students increased by 29%. It also found that, despite claims to the contrary, participation in the school lunch program did not differ significantly after the new national standards were implemented. The Robert Wood Johnson Foundation conducted a study to assess changes in the energy and nutrient density of 1.7 million school meals and the meal participation rates before and after implementation of the Healthy, Hunger-Free Kids Act, which took effect at the beginning of the 2012-13 school year. The act updated the meal patterns and nutrition standards for the National School Lunch Program and the School Breakfast Program to align with the 2010 Dietary Guidelines for Americans. The study found that food policy in the form of improved nutrition standards was associated with the selection of foods higher in nutrients that are of importance in adolescence and lower in energy density. "This study is the latest in a long list of evidence which shows that stronger school meal standards are leading to healthier habits in schools. Children are eating more fruits and vegetables and consuming more nutrients, making them better prepared to learn and succeed in the classroom,” Agriculture Secretary Tom Vilsack said. “Implementation of the new meal standards was not associated with a negative effect on student meal participation,” the study found. Participation was 47% before implementation and 46% after — a negligible difference. Congress is set to take up reauthorization of the school nutrition program this year, and the report was used as another indicator of the success, supporters said. Vilsack noted, “After decades of a growing obesity epidemic that harmed the health and future of our children and cost our country billions, we are starting to see progress in preventing this disease. Now is not the time to take as step backwards in our efforts to do what is right for our children's health. I urge Congress to reauthorize the child nutrition programs as soon as possible and to maintain the high standards set by the Healthy, Hunger-Free Kids Act." Tom Stenzel, president and chief executive officer of the United Fresh Produce Assn., added that this study shows that students are choosing healthier meals largely because of the increased availability and variety of fruits and vegetables in school meals. “These results reinforce the need to continue, not roll back, the good work going on in schools across the country, which includes offering plenty of fresh fruits and vegetables to the more than 30 million kids who rely on school meals every day. 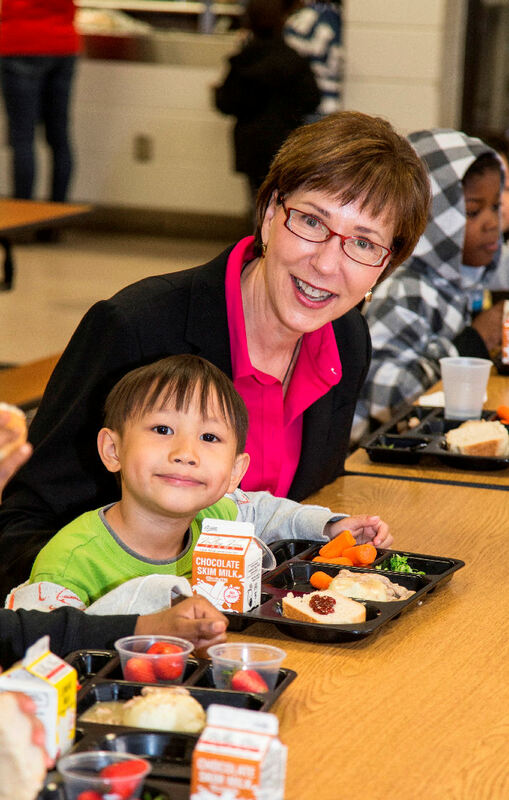 Healthy school meals help children ‘make half their plate fruits and vegetables.’ I urge Congress to maintain the strong fruit and vegetable standards in school meals as they work to reauthorize the child nutrition programs,” Stenzel said. Senate Agriculture Committee members have committed to holding a business meeting in January to discuss their bipartisan school nutrition reauthorization bill. A date has not been set, and a draft of the legislation has not been made public, either.